'Get up, take your mat and walk'? When I saw that we were going to make l'Opera I was so excited. I'm reasonably certain that the reason I knew about the cake was seeing it in the windows of pastry shops in Paris. You can't miss the name, as it's written across the cake. I love looking at the exquisite desserts in the windows of the pâtisseries in Paris. Unfortunately I never went in to buy anything, as I was not in the market for cakes and the like. And also, unfortunately, I forgot to read the Daring Baker recipe. I saw that the recipe came from Dorie Greenspan's book Paris Sweets, and since I own the book I went right to it. 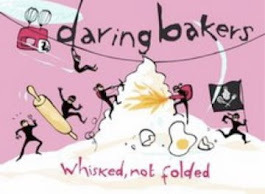 I never bothered to read the Daring Baker recipe. I simply made Dorie's cake. So when I finally looked at the recipe, what a tremendous disappointment it was to see that we were not to use chocolate or coffee flavoring. Well the cake took me soooo long to make that there was no doing it again. I will simply submit my erroneous, but VERY delicious, l'Opera! 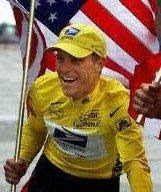 And I'm not meaning to dis on Lance Armstrong. Why, as a matter of fact, I stood in the hot afternoon sun on the Champs Elysées for three hours just to see Lance Armstrong come riding in first for the 2001 Tour de France. And then I watched as he rode the loop from the Place de la Concorde to the Arc de Triomphe ten times. The cake took me three days to make. And I was very nervous about all the elements. By the time I had most of the elements finished on Monday I just wanted to go to bed, so I packed everything up and went to bed. Then Tuesday I was very busy, and couldn't even get to the cake until 9:30 PM. I assembled it, save the glaze, and wrapped it up and put it into the refrigerator. Then today I finally finished it, while keeping Emily busy watching Max and Ruby. joconde: I ground almonds in my Cuisanart, putting a tablespoon of flour into the mix to prevent clumping. I think it all went well, but maybe I didn't get it fine enough. The cake itself was quite easy, but my biggest hitch was that my pans were a bit bigger than specified - 12x17. This made for a thinner cake. I cooked one in my Miele, and one in my Lacanche electric oven. They were done in six minutes. Then we had friends stop by who were hoping to have a piece, and me not having any idea how much longer this would take. So next I made the simple syrup - just water and sugar, as I was planning to add some cognac later. Then came my most feared element. French coffee butter cream: This turned out to be a complete disaster on my first try. I had the eggs beating in the Kitchenaide, and there was the coffee sitting ready to go in, the soft butter cut into hunks, and the water and sugar boiling on the stove. I was using my extra fancy candy thermometer, recommended by Emiril. But it just wasn't coming up to temperature and the syrup was diminishing rapidly. I finally decided that the thermometer was not working and I slowly poured in the syrup into the eggs. Major Disaster! Hard sugar stuck to the sides of the bowl, and the beaters looked like I was trying to make cotton candy. But I persisted. When the bowl felt room temperature to me I began putting in the butter. Immediately it turned to liquid. At that I quit and we all went out for dinner. On the way home I told Riley that I just didn't want to try that again, but he encouraged me to hang in there and do it again. So when we got home I went right back to making butter cream, but this time, before I had hardly begun, my husband had a brilliant idea. He got out my electronic gun temperature taker. It was awesome. I would recommend to anyone needing to use a candy thermometer to use the gun instead. It didn't take long at all for the sugar syrup to come to temperature. And a second good idea - I used my hand mixer instead of the Kitchenaide stand mixer. The syrup and egg combined beautifully. So then for the next problem - adding the butter. I decided to use the gun again. I check the temperature of the butter - 71 degrees. Then I checked the egg and sugar mixture, which I thought was cool enough. It was 85 degrees. So I got a bowl filled with ice, and set the egg and sugar mixture bowl in it. It took a fairly long time for the mixture to reach 71 dgrees. But when it did, and I added the butter, it all mixed wonderfully. When all mixed I add the coffee, 4 teaspoons, and it was really really yummy. So the next element was the chocolate ganache. Compared to the French butter cream, the ganache was a piece of cake. It took almost not effort at all the come up with the ganache. I did make an effort to chop up the bittersweet chocolate nice and fine. I heated the cream and milk in the microwave, add the finely chopped chocolate, the mixed with my hand mixer, and I then had beautiful ganache. At this point I was done for the day! I'd learned a lot, but my brain couldn't handle any more learning for the day. The next way I had the kids, and I had to go to a meeting at church, and I had to pick up a daughter after work, so at 9:30 I took the butter cream and ganache out of the refrigerator to thaw a bit, and sat down to watch Jeapordy. Being a Scot, I couldn't cut up the cake and discarding some. So I decided that I'd make a four layer cake. I should have started with the ganache, but I didn't. I got the cakes cut in half, and added cognac to the simple syrup, and fluffed up the butter cream, and then decided to put a layer of chocolate on the bottom of the cake, placing it on a piece of parchment on a big upside-down cake pan. Then I but syrup on the first layer, then butter cream. The next two layers were of ganache, because it occured to me that the last layer had to be buttercream. 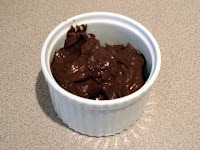 The ganache was soooo hard that I couldn't whip it up, so I put it into the microwave for 20 seconds. At first I was going to do 40 seconds, but I decided to be more cautious. That was such a good idea. Any more heating and it would have been a melted mess. As it was, it whipped up very nicely. In the end I forgot to put syrup on the last layer, which irked me a lot. I then put the whole thing into the basement refrigerator to chill up a while before I put the plastic wrap on for the night. I then proceeded to get thuroughly sucked into watching the Mariners/Red Sox game. The Mariners won!!! 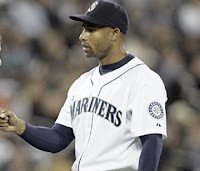 Admittedly the Red Sox had some bad luck, but it was so nice to see the Mariners win. I got to bed at 1:30. This morning, while Emily was in her chair eating her breakfast and watching Max and Ruby, I brought the cake up and went to work. I did the mis en place routine, making sure nothing would hinder my efforts. Then I made the glaze, first clarifying the butter. I found that it was easier than I'd thought. I just herded the foam bits to one area and scooped them up. Then I added it the the chocolate that I'd chopped up, and put it in the microwave for about 30 seconds, and gave it a good thorough stir. With the cake positioned on a wrack, over a baking sheet I carefully spooned on the glaze. One thing that I discovered was that the suggestion to smooth out the glaze with a pallet knife wasn't right, because the glaze was setting up straight away because the cake was so cold. The knife just made things messy. But I didn't do much smoothing. I think it turned out great. Then I carefully moved the cake to the cutting board, and squared it up. Then I put it on the serving plate, and put it in the basement. Assessment: When all is said and done, when all the lessons are learned, this wasn't such a terribly difficult cake to make, and it was very delicious. 1. The joconde was an easy cake, and buying to almonds at Trader Joe's really cut the cost. I followed the CIA directions and put a tablespoon of flour into the almonds while grinding them up. I do need a small jelly roll pan, as 12x17 was a bit too big. I make a four layer cake in the end, because of the big sheets. 2. The butter cream is a complete disaster when it goes wrong. Candy thermometers are a pain, but my thermometer gun was fantastic. It's essential to remember that room temperature (about 71 degrees) is quite a bit colder than body temperature (98 degrees). To feel something and think it is room temperature because it doesn't feel warm will not work. Stirring the egg and sugar mixture over ice was very helpful. 3. It's good to remember that ganache is easy and really tasty. It's actually the center for truffles. I bet it takes on flavors really well. 4. I made the syrup up ahead of time, and added the cognac just before using it. This seems a good idea. 5. The glaze was so amazing. Of course I was pouring it over a very chilled cake. I did learn not to touch the glaze, but to just carefully pour it on. When I was clarifying the butter I found that just gently skooting the foam to one side of the pan (kind of like herding sheep) make it easy to scoop out. A Daring Baker who is actually a pastry chef, sugar chef, and can make a dead flat cake, recommended that I pour on the glaze when it's 90 degrees, and then just give the cake a gentle shake to even things out. 6. I cut the cake with my very big German bread knife. It wasn't perfect, but I don't imagine having the perfect knife for the job anytime soon. On one side of the cake I used a daughter's fancy Japanese knife and it didn't work as well. 7. I'm so going to put this cake in my repertoire. When trimmed up it serves an easy 16 people, if you don't count what was cut off. I could think of changing the butter cream flavor - though I really liked the coffee. And the ganache could take on many flavors. AH, a true Opera Torte. I'llbe back to read more. That does it! I need a go at the real deal. Molly I wish I'd made your 'mistake'! Beautiful cake! Yes, I did make a 'real' opera as well a few days ago and it was really awesome - although i made my own much easier version of coffee buttercream! Great job on yours! Amen to mistakes! Your cake is tres belle! Beautiful job..so well illustrated in your synopsis of the cake preparations! :) ..and.. I lve your blog! You're cake looks great and because you asked the secret to getting the top smooth is to use it at the right temperature. 90 degrees is best. Spread it on and let it run over the sides then give it a little shake to even it out and refrigerate it. Your cake looks great! Truely wonderful! Good for you and your "mistake" :) Your cake looks delish! I've dropped some hints to my hubby that a thermometer gun would make a great birthday present. I have to admit that I never tried or saw an opera cake until this challenge. Your cake looks gorgeous! 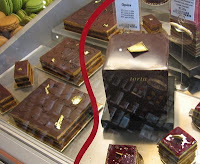 Your just ahead of the game as most of the other DBs I've visited are now pining to make a traditional Opera cake. I love your chocolate opera, and it looks like the loving effort you put into the buttercream paid off big time. Bravisimo! Hi Molly! Thanks for your comment! My first buttercream try was a total disaster too. Mine just wouldn't thicken enough to spread it. I ended up pouring it and it was total mess. But the taste of the cake itself was just amazing. I did make another cake so that I can take a decent picture :) But it got beat at taste by the 'disaster' cake. So you did what a lot of us wished to do, and are going to do: the chocolate/coffee version. Well, it looks beautiful! AND I like your Churchill-quote! Your Opera Cake looks amazing! I really liked the spring one, but I know I would like the traditional one even better. How awesome that you got to go to France, that's a dream of mine.